Summit Cycle Solutions welcomes Bike Florida 2019 to the family. We are thrilled to be supporting this amazing event! 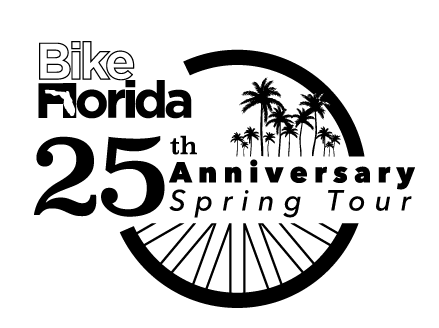 the following information will assist you in planning for Bike Florida 2019.
the s.c.s. team is available for phone conversations via the home page meeting scheduler. participants may also contact the s.c.s. team via email here. All services are booked "a la carte". We believe in choosing your own adventure! Lodging Accommodations: Summit Cycle Solutions has attained hundreds of lodging (hotel) units for the 2019 tour. Quality, price, and location all vary. Selections are made via the online booking platform. Be sure to read all descriptions and terms before purchasing! S.C.S. will be firm on all such terms in 2019. "Glamping" Accommodations: Want a more economical lodging scenario? We have you covered! Summit Cycle Solutions will set up, take down, and provide you with camping accommodations at the HQ each night. Shuttle Transportation: Want to sleep in a hotel but don't care to bike the extra mileage to the hotel? S.C.S. has you covered with shuttle transportation options. Additionally, B.F.L. will be offering a secured bike corral for your bike! Luggage Transportation: Summit Cycle Solutions will be providing one way luggage transportation from Brooksville to Inverness on April 1st, 2019. This allows the customer to make the transfer on the bike! This service does not include a return transport to Brooksville. Real Time Communication: All customers receive real time communication services. Customers receive text alerts, onsite customer service, and an active 24/7 urgent matter phone line. This service is included as complimentary. STEP 1 - Review Options / Select "Book Now"
*Special Note* Please be sure to review details before selecting, "book now". When booking hotel services please work through dates in a linear fashion starting with the 28th, 29th, and so forth. IMPORTANT - Each customer has 15 minutes to complete a booking. Due to demand S.C.S. does not allow for inventory to sit in a shopping cart for longer than 15 minutes. 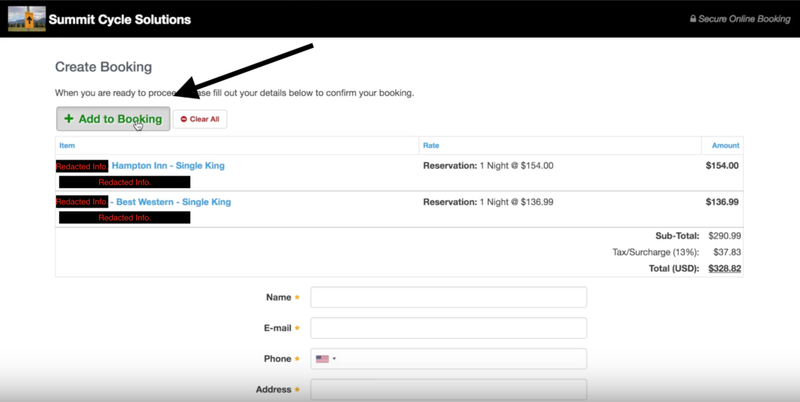 STEP 2 - Use "Add to Booking"
*Special Note* Please be sure to use the "add to booking" button after selecting each nights lodging. This will allow for one singular, expedited checkout. *Special Note* Please be sure to review all items & terms one last time before checking out. + General Question: Why use Summit Cycle Solutions? Answer: All services are managed through contractual agreements. Without giving away trade secrets, you can rest assured that our team manages all reservations diligently via a contract. We also always have a back up plan...we are in the business of events after all. Additionally, S.C.S. coordinates with event organizers to provide operational support (Buses, Luggage Transfers, Communication, Etc.). Lastly, a large portion of revenues is returned to the event...supporting communities all over the great state of Florida! + GENERAL Question: When will S.C.S. start accepting reservations? Answer: S.C.S. "book now" portals are currently slated to open in alignment with route announcements. Please visit the B.F.L. site for more infomration. + GENERAL Question: Why does S.C.S. give full week lodging reservations priority? Answer: We call it the “domino” effect. The primary issue is that partial week reservations incurred eliminate inventory for participants seeking full week lodging packages. + General Question: How does S.C.S. determine pricing? Answer: S.C.S. only adds mark up to rooms negotiated down to direct rates. If a hotel room cannot be negotiated down then a small admin fee is added to the price of the lodging unit. In 2018 typically this fee was around $15 dollars. S.C.S. is contractually obligated to a maximum/minimum markup guarantee...passing along savings to the customer! Tax/surcharge rates are not typically controlled by S.C.S. These percentages are mandated by various town & resort entities. Please note that resort municipalities can often charge over inflated rates...some as high as 18%. We think it's crazy too! + General Question: Can I purchase over the phone? Answer: Yes! You may schedule a time to speak with an S.C.S. Representative on the home page. S.C.S. 's urgent phone line is used during events only. With thousands of reservations, S.C.S. does work to streamline calls. Warning Inventory is live on the website. It is S.C.S. 's recommendation that you book online as we typically sell out quickly. + General Question: How long do I have to book once I have gained access to the site? Answer: 15 minutes! With thousands of reservations coming in... S.C.S. does limit the amount of time a customer can "sit" on the inventory prior to checking out. Thank you for understanding! Please note that the timer does not start until you click on the "book now" button. + Lodging Question: Do room rates include breakfast? Answer: S.C.S. will note properties including breakfast under the details tab located within the book now portal. S.C.S. cannot honor the quality, timing, or the guarantee of breakfast each morning. Such items are under the direct control of the property. Breakfast is available for purchase at the start venue each morning. + Lodging question: Can I purchase partial week reservations/services? Answer: Full week participants with luggage transport are given priority. S.C.S. will open for partial week booking at a later date (TBD). If one night of S.C.S. inventory sells out... participants may book the maximum services/hotels available then book "on own" for any nights not available through S.C.S. + LODGING Question: Can I cancel my reservation at any time? Payment in full is required at the time of booking as inventory is live. Cancellations shall incur a 20% administrative fee on the total reservation amount (including taxes). For Bike Forida, no cancellations shall be allowed after February 15th, 2019. + LODGING Question: Are reservations transferable? Answer: Yes & No. If a participant needs to cancel a reservation, S.C.S. will then offer his/her lodging package for resale. If a resale occurs, S.C.S. will refund the original participant less the 20% cancellation fee. In 2018, most all cancellations were partially refunded thanks to a high demand! This process must be managed via S.C.S. in order to ensure contractual compliance. + LUGGAGE Transfer Question: What size bag can I have? Answer: 65 lbs. is the maximum weight for 2018. Maximum weight limits will be enforced in 2019. Participants are requested to ensure that they have purchased enough services prior to arrival. One Booking = One Bag Transfer. + LUGGAGE Transfer Question: Where do I leave bags for the transfer to Inverness? Answer: Participants will have a designated area to drop off/pick up luggage. These areas are typically identified with S.C.S. signage and a security camera. + SHUTTLE Question: Is there shuttle transportation to S.C.S. lodging properties? Answer: Yes, if purchased! All S.C.S. services are purchased "a la carte". + SHUTTLE Question: Can I take my bike on the shuttle? Answer: No. All towns have a secured, designated bike corral for each night of the tour. Please leave your bike in the bike corral and proceed to your hotel via the shuttle route. Shuttles to/from Tampa International Airport will have a complimentary bike transport service included. Please be sure to have your bike boxed - thank you. + SHUTTLE Question: Do shuttles run on a time schedule? Answer: Yes. Shuttles run on prescheduled times with specific quantites predeterimned. Partipants elect for a specifc shuttle time each day. Do not miss the bus!